Countering PM Tony Abbott’s lashing out at the Human Rights Commission’s findings in The Forgotten Children, Lachlan Dale offers solutions to help get asylum seeker children out of detention. On Thursday morning a 300 page report, The Forgotten Children, was released by the Human Rights Commission. The Forgotten Children explores the effects of Australia’s “refugee policy” on children. It is based on interviews with over 1,100 kids; on verifiable data; on interviews with mental health experts; and on analysis supported by detailed academic research. The report says that children locked up in Nauru “are suffering from extreme levels of physical, emotional, psychological and developmental distress” and that over 100 children have been on suicide watch, with over 120 children having self-harmed. I am 12 years old and my life is really bad and I leave in a jail. Why I have a bad life. I think to stay in the room for ever when I go because if I stay in room no eat no drink. I will die. Better I kill myself. My father and brother were killed. I saw death on the way here. I wouldn’t be here if I didn’t have to be. …it’s quite clear that we’ve got a large number of children with significant mental distress and disorder in this population. This might shock some people, but to people who are close to this issue none of this is surprising or new. We’ve long known that locking kids up like this destroys their mental health – it’s well established. 2: Break international law and severely damage men, women and children. No, that would be stupid – but there really is no shortage of options. One would be to do exactly the same thing as we are doing now, but actually process refugees. This isn’t a huge tweak, but it’s an improvement. Another option would be to openly and publicly collaborate with other nations to increase regional resettlement intake. Not only would we cut down on all the suffering, but this would save us the huge cost of locking thousands of people up indefinitely. Another option again could be to work with an organisation like the United Nations to try and address refugee influx within the parameters of human rights law (instead of stomping all over it). Or how about making a few tiny adjustments to conditions to chill out on the whole “inflicting intense psychological harm” thing? Maybe we could look at changing a few things to reduce the crazy prevalence of suicide attempts. See? There are no shortage of options. But exploring them requires political will and leadership – and our politicians are just not game. They’ve backed themselves into a corner, and benefit from staying there. Why change when the alternatives are hard work? Well, because just accepting the suffering of kids on our watch isn’t exactly easy either. Lachlan R. Dale is a writer, obscure musician, and owner of Art As Catharsis. He is currently undertaking a masters of creative writing at the University of Technology Sydney. Thanks Rainer, I appreciate it. You hit it right on the head. People get too caught up in the politics. I don’t care about LNP and ALP trying to score points off each other – I do care about kids in our care feeling so depressed that they dream of ending their life. That’s messed up. I don’t know how anyone can be at peace with that. Thanks Lachlan, a great post. Reading other discussion forums left me disgusted at the debate, which centred around Australia’s policy on refugees as the usual for and against arguments were brought up. 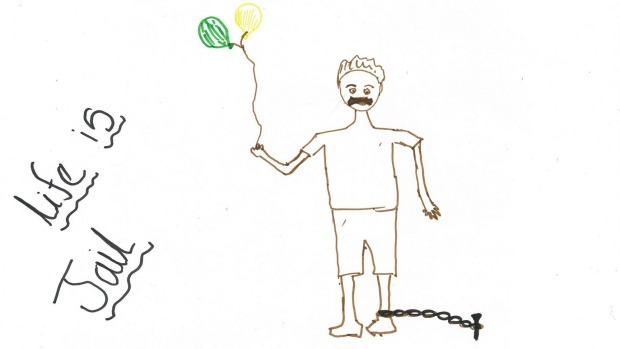 This report is about CHILDREN incarcerated in prisons. CHILDREN who are innocent and bear no responsibility, fault of their own or participation in this fucked up world we live in. And yet we see it as appropriate to lock them up in facilities that are lower than state prisons. Free them, get them into the community and treat them as if they were our own. That is the decent thing to do, to even include them into the political football discussion we have is Unaustralian at best.